Boston Marathon Portraits features dramatic images of exceptional runners, in an exceptional race, doing the exceptional: starting, finishing and celebrating success on the ultimate runner's journey, the Boston Marathon. Live and in color. On race day, Boston comes alive with anticipation, excitement, motivation, determination, speed, challenges, success, disappointment, elation, pain, and finally, no matter what it takes to cross that finish line: pride. This book presents these emotions and the action of the Boston Marathon, focusing on striking scenes and candid photos of runners before the race, at the starting line, the finish line and when the celebration of finishing begins. 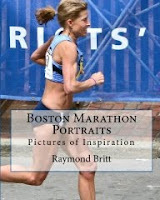 With images shot primarily at the 2009 Boston Marathon, the book features more than 120 full-color photos in a large 8x10 format, capturing the spectrum of inspiring runners of all ages from around the world. Featured elite runners include Americans Kara Goucher and Ryan Hall, former champions Robert Cheruiyot and Lidiya Gregoryeva, race winners Salina Kogei and Deriba Merga, and others.